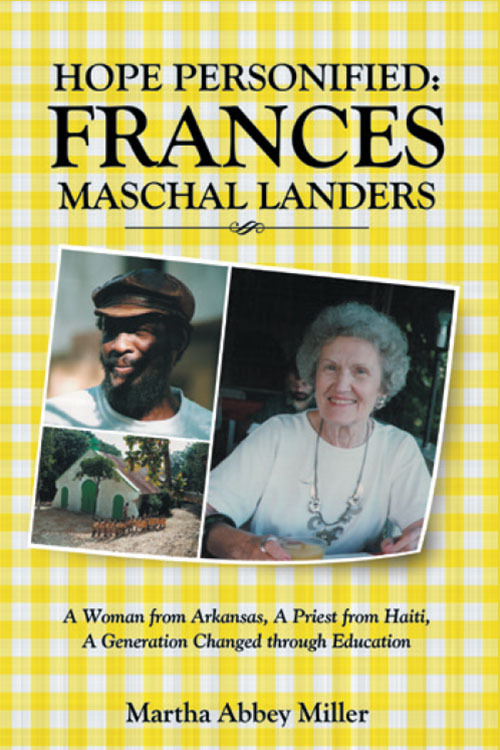 Frances Landers, the founder of the Haiti Education Foundation, and Father Jean-Wilfrid Albert, designed a budget in which $75 provides a full year of school for one child. 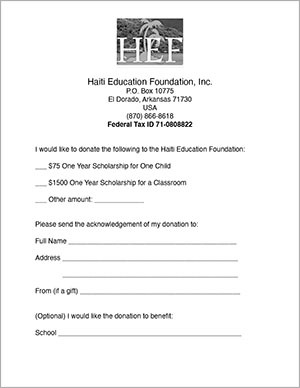 Our primary focus is obtaining a $75 annual scholarship for each of the approximate 7,000 students attending 35 Haiti Education Foundation supported schools. How can such a small amount of money do so much? The average yearly income in Haiti is less than $300, so supplies are cheap and salaries are low. 100% of all donations are used as designated by the donor; there are no administrative expenses (•note). You can help by sponsoring a child for $75. Renew your sponsorship each year before the October school term opens. Once a child receives a scholarship to attend an HEF school, they are guaranteed a scholarship until their education is complete. If you would rather mail in your donation, or if you would like to make your donation in memory of or in honor of someone special, click on the image above to download the form (pdf), fill it out and mail it in with your donation check or money order. You may make a donation in honor of someone. In the 'Honoree' field, include the name of the person that the donation is in honor of. If you would like a card sent to them include the address the card should be mailed to. Choose your own amount to donate. In the note field, give details about where you would like your donation directed. Become a monthly supporter. Just enter the amount of your monthly pledge below and click the "Monthly Pledge" button. You will be taken to a secure page to make your monthly pledge. After successfully rebuilding of many of our schools, most recently St Philippe & St Jacques and our St Luc school, we would now like to focus our construction efforts at the St Andre School in Cavanack. Our plans are to build an 8-room schoolhouse for our kindergarten through fifth grade. We will need to raise $80,000 to do the project. Like the others, it will be earthquake and hurricane resistant, with concrete and welded steel joists and a coated heavy-duty steel roof. Please help us make this new school a reality for this small community! These funds will be used as needed to help in disaster recovery. Make a donation to help the relief effort. HEF offers an opportunity of giving to the "Poorest of the Poor" gift fund. This donation is used by the priests and their congregations during Christmas to give to the least fortunate in their church communities. A special church service is held and gifts are given to those most in need. Often, there is a special Christmas Party held at the church following the service. In this way, the church has the opportunity to reach out in their community and help those who have nothing. •note: When paying online via Paypal a charge will be added to cover the credit card processing fee so that the entire donation will go to the intended purpose. This charge will be displayed as "shipping".